A trailer has finally emerged for Australia's next great psychological horror film, The Clinic. Part Vanishing, part Saw, the film looks like it'll bring a much needed twist to the typical backwoods horror genre. 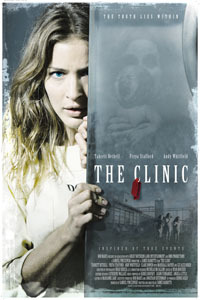 Clinic is the story of expectant mother Beth Church, drugged and abducted from a desolate outback motel. The year is 1979, many years before the advent of DNA. Beth wakens in an ice bath in an abandoned abattoir. Her baby has been removed from her. After searching for a way out she is found by three other young women all in the same predicament. There is also one other young woman in the same predicament, Beth and the other three women soon discover that it is everyone for themselves as they find themselves in a deadly game of survival. Directed by feature length first timer James Rabbitts, The Clinic stars Spartacus: Blood and Sand star Andy Whitfield and Clare Bowen. Im in the US and I'd like to see/buy a DVD where can I locate one? No word on a release yet. It's just been completed and is probably looking for US distro. As soon as we know, we'll update readers. We want to see it too. Tabrett Bethell is an amazing actress. I'm sure she will go far. still no word on a release date yet? Watched the first season of Spartacus this passed weekend and I can't get enough of Andy Whitfield!! When do you expect this film to release in the U.S.A.? This was filmed in my hometown, when will it be released in oz? Oh c'mon guys! Does anyone konws when this super movie will appear on the TV or in the cinema?? I can't wait any longer to see Tabrett! !